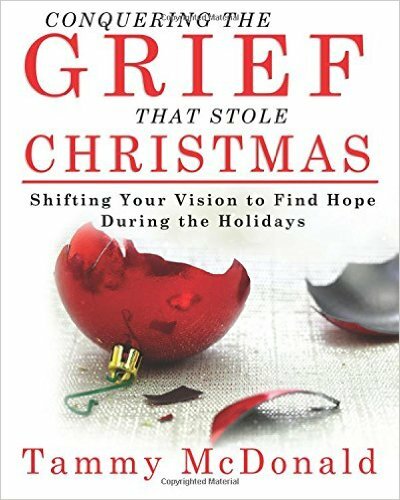 Conquering the Grief that stole Christmas is not just another self help grief book–It is a breakthrough interactive healing experience. “When I lost my 13 year old son on December 30 , I never thought a happy holiday season would ever be possible again.”, says Cina Brown. Tammy McDonald doesn’t fill your head with empty promises. This book makes you participate in your healing. It’s a realistic approach of what to expect and how to plan ahead to make the holidays bearable. It’s supported by the true Word of God , with scriptures that ease your grieving, painful moments and give you hope. Conquering the Grief that Stole Christmas will change your life. Through Tammy, God has given us a plan of healing. You will learn that even though this journey isn’t easy, God is with you every step of the way. There is hope!